If you check out product labels, you will generally find that they cater to (i) normal skin, (ii) dry skin, (iii) oily skin or (iv) sensitive skin. In this blog, we have always been focused on eczema skin that typically belongs to the dry skin type, sensitive skin (when we cover and irritants to avoid) and to some extent oily skin, when we discussed about acne. MarcieMom: Alana, thank you so much for helping out with this series on makeup! I’m excited to learn more about it, especially when I’m clueless when it comes to makeup (I hardly use any!). Dry Skin Type – (i) Almost invisible pores, (ii) dull, rough complexion, (iii) red patches, (iv) less elasticity, (v) more visible lines and (vi) when exposed to drying factors, skin can crack, peel, or become itchy, irritated, or inflamed. Alana, most people may have difficulty figuring out their skin types or have a combination of skin types. Moreover, certain conditions such as skin disorders, smoking, medications, diet, stress, sun exposure, pollution, climate and existing beauty products may mask the real skin type. What is your advice on how we can figure out our skin type and how important is it to get the skin type right? Alana: First, finding your right skin type is so important. Many people purchase products that aren’t necessarily right for their skin type, which can be either useless, or counterproductive in terms of achieving desired results. For instance: if someone with dry skin were to purchase a product specifically designed for oily skin, they are not likely to get the level of hydration they want (and more importantly, need). Figuring out your skin type is not always easy, which is where dermatologists and medical estheticians come into play! Going to one of these professionals may seem extreme, but it is the best first line of action in realizing your skin type and finding products that will work best for your skin type! MarcieMom: I’m interested to find out what are the key differences in the formulation when a company label its product as suitable for (i) dry skin, (ii) oily skin and (iii) sensitive skin? Are there any regulations that govern when a company can label itself as such? Alana: Key differences in these formulations typically address the markers of each skin type. For instance: dry skin formulas are typically more emollient. Many of these products use oils to nourish the skin, which is essential when you are dealing with any type of dryness or dehydration. In regards to makeup, dry skin users will want to lean more towards liquid formulations more than powder. I highly recommend looking into mineral makeup brands like YoungBlood Cosmetics, which use only the finest minerals while catering to even the most sensitive skin types. Products designed for oily skin types are typically more mattifying. These formulas are often oil free, and lightweight, which helps to absorb excess oil and regulate oil production. Many people with oily skin will favor makeup that comes in powder form, but there are many fabulous mattifying liquid options that have recently hit the market as well. 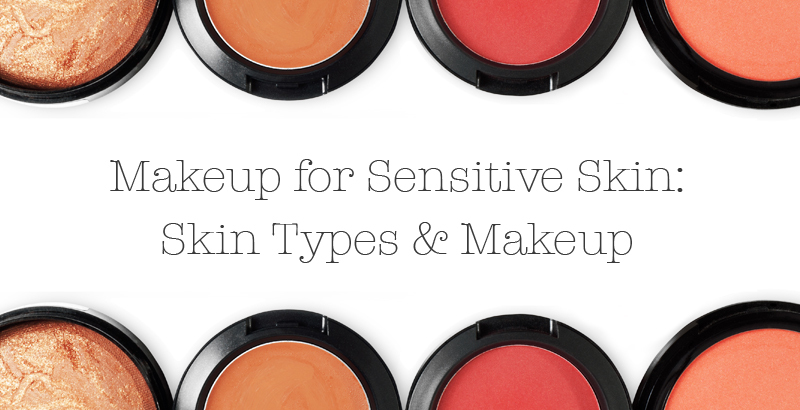 Sensitive skin products are known as the more “gentle” formulas. These are typically (though not always) formulated with fewer harsh ingredients, and have been made with sensitive skin types in mind. It is important to note that just because a product is designed for sensitive skin, that does not mean your skin will take a liking to it! All skin is different, so even with sensitive or gentle products, you will still want to apply a patch test 24-48 in advance to using the product to ensure your skin will react well to it. I have not typically seen brands that put out a “sensitive” range for makeup. They are either friendly to sensitive skin as a whole, or they don’t formulate with sensitive skin in mind at all. Because of this, it is essential to look into the brands you are buying from, before you actually make your purchase. I have had wonderful experience with brands such as 100% Pure, Blinc Cosmetics, Glo Minerals, La Bella Donna, and again, YoungBlood Cosmetics. There aren’t any firm regulations when it comes to labeling products for skin types. That being said, companies do have reputations to uphold, so it is important that they label their products for the right skin types accordingly. Your best bet is to ask your esthetician or dermatologist, and reading product reviews can also be very helpful as well! MarcieMom: I’m the sort of gal whose makeup is just foundation and lipstick. 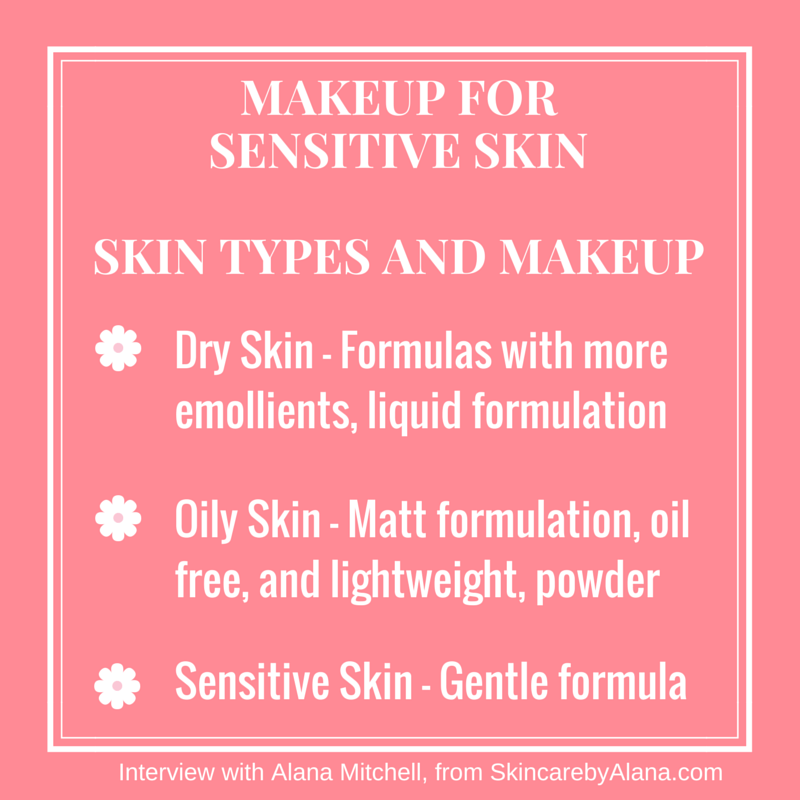 Alana, what in your view, are the must-haves for makeup and are there certain types makeup (foundation, blusher, mascara, eyeliner) that certain skin types should not use or is it possible to find something for every skin type? Alana: My three essentials are: mascara, tinted sunscreen, and lip gloss. Being a busy mom and business owner, I know all about getting ready on-the-go, and these three things are fantastic for making you look and feel confident in a pinch! Makeup must-haves are always a personal thing, but if I could list one essential, it would be some form of tinted SPF. Tinted sunscreens are a great way to get coverage, protection, and hydration. If oily skin is more of a concern for you, you can also reach for a powdered sunscreen brush! These brushes are amazing, because they are so easy to keep in your purse, so easy to touch up, and will mop up oil without making your face look cakey or over-done. The good news is: regardless of you skin type, there is bound to be an option out there for you. It is all a matter of research and recommendation. If you have had little to no luck, call an esthetician! My medical estheticians and I are available during business hours via phone, chat, and email to help shoppers in finding the perfect products for their skin type. It may sometimes be difficult, but I guarantee you it can be done. Thank you so much for sharing your expertise on skin types and makeup with us. I think we all benefit from knowing more about skin types and understanding how that relates to selecting makeup. Next week, we will focus on sensitive skin, can’t wait!